Confession: I used to be a reading snob. I can admit that now. I’ve taken ownership of my wicked past and have seen the light. What I mean is that I used to look down on the short story. I might take a crack at a novella- but only if the author was solid. A short story just didn’t seem to be worth my time. My stumbles at Tolkien notwithstanding, the novel was it for me. A good novel (preferably at least 300 pages) meant plenty of time focused on a single story and roster of characters. I’d work my way through the obligatory introductions by the author (“Todd, meet Gandalf. Gandalf, meet Todd…”) and settle in to the meat of the story. I’d enjoy the novel through its resolution then, usually, flip back to the book’s beginning looking for the “Also by…” list in the hope that it was a single entry of a larger series. 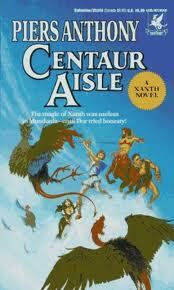 One of the first fantasy novels that I read, by the brilliant Piers Anthony, was Centaur Aisle. That book was picked because with the word “centaur” in the title I figured there was no way it could be anything but fantasy. This led to a short-lived habit of selecting books based on the font and color of the title on the book spine- usually evaluated by standing in a library aisle with my head cocked 90° to the right. Centaur Aisle, with a vaguely medieval font on a sky blue field, was a perfect example of that practice. That particular book was an excellent choice for a young novel aficionado. Although I had unknowingly skipped the first three books in the Xanth series, the novel lived up to my expectations. I quickly got myself up to speed on the world and characters and I was off! I finished that one and circled back to the first three books that I had missed. Piers Anthony also became the first author that I really sought out. I soon discovered the breadth of his work and got my hands on anything he wrote. All was well in my adolescent head- until I hit Anthonology, his collection of short stories. I had accidentally picked up short story collections in the past but this was the first time that I can remember picking up one from my sparse list of favorite authors. I was honestly at a loss here. On one hand, Piers Anthony was an A-list writer (pun intended, as any reader of the Xanth books will appreciate). I’d read just about everything of his I could get my hands on- 6 or 7 Xanth books, early entries in the Apprentice Adept and Incarnations of Immortality series, and even a poorly understood attempt at his Tarot books. However, the short story was my nemesis. I’d barely get comfortable with the setting, plot and characters and then- BANG- it would be over. What was the point? At that point, I could not afford to be picky. My desire to hide away from the world inside a good book meant that I’d exhausted every bit of decent reading material available. (It would not be until a few years later that I would grow to appreciate re-reading a good book. Nice, that. Like catching up with an old friend that you hadn’t seen in some time.) I opened the book and began reading. I figured I owed Piers at least that much for all of the satisfaction he’d given me already. That changed my entire outlook. I admired the wry wit of “The Life of the Stripe”. By the time I reached “On the Uses of Torture” I was in awe. The author had created these entirely complete stories- beginning, middle and end- sometimes in just a few pages. Thanks to Mr. Anthony, the short story was now on my radar. As I matured, my list of favorite authors grew. I discovered the worlds of Roger Zelazny and Robert Heinlein– usually through a robust novel or series. The Chronicles of Amber books and Stranger in a Strange Land remain at the top of my all time favorites list, alongside Mr. Anthony’s own Incarnations of Immortality series. However, I’d always be delighted from that moment on to discover a collection of those authors’ short stories. Zelazny’s The Last Defender of Camelot (most notably the titular story of Lancelot’s modern struggle) and Heinlein’s The Past Through Tomorrow (” ‘If This Goes On…’ “) sit solidly next to any longer piece. I began thinking about this topic- the short story- the other day while boxing up old books to give to friends or donate to the Rescue Mission. I was overdue in keeping a promise to my wife. When she bought me my first eReader a couple of years, I promised that as I was able to find my old favorites in digital form, I’d begin shedding the accumulated weight of 25+ years of reading and collecting books. I’d made significant progress in building my digital library over the last couple of years and, in acknowledgement of my wife’s ascetic tastes, was ready to move the books out. In packing up my old companions, I came across my beat up copy of Anthonology. This book had truly been buried under its peers in recent years in the second layer of books on one of my bookshelves. I picked it up with that comfortable feeling of recognition. The packing was slightly delayed while I spent some time revisiting those stories. It’s only now, as a 40 year old man (and father! ), I realized what it is about short stories that draws such appreciation from me. A common theme in my conversations with my sons is the value in doing something well. I know that I’m not alone in this- parents want to teach their children that a job well done has its own intrinsic value. This is illustrated in the Japanese tea ceremony. The overt actions, preparing and serving tea to a small group, are of secondary importance. The tea ceremony’s primary lesson, to my understanding, is one of respect for something done well- in this case, the seemingly simple act of sharing a pot of tea. There should be an innate satisfaction in mastering something. It is our stamp on the world. It is our moment to exert our will over our own human imperfection. I appreciate the skill it takes to write a short story well. To be able to capture all of the elements of a tale- setting, character, plot, theme- and do it so succinctly is admirable. Nowadays I have no real preference in the format of my readings. Similar to my willingness to embrace ebooks, it’s about the quality of what I’m reading, not the format that the author chooses to utilize. An author that tells a story well is worth reading- whether as a short story, novel, play, or poem. Why miss out on the good stuff because you don’t like the way that it was packaged? He won, despite their best attempts. I can totally relate to you finding an author and sucking in everything they have written. Of course you are a bit more high brow than me and my V.C. Andrews obsession of MY early teen years….great writing!!! For me it was the Russian author, Issac Asimov, and Foundations Edge. I took a part-time job as a library page and spent most of my time combing the racks for my next read. Unbelievably 28 years ago there was no electronic way to track no overdue library books or assess fines. I would return paperback books crammed into shopping bags in the dark hours. Thanks for letting me revisit my past. I look forward to reading more of your writing. Thanks for sharing that Kate! I never knew that you were an Asimov fan. Why did they even bother to name the movie “I, Robot”- there was nothing there that Asimov wrote other than some character names!